My wife and I just got married. It’s been two weeks thus far. 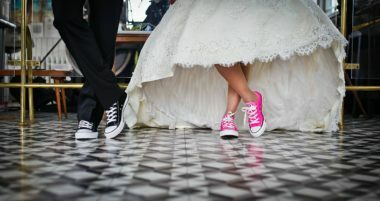 Prior to getting married, I wrote the first part of these two articles, with some pre-planning strategies that we were working with. The first part can be found HERE. Today, I am writing the follow-up of that post. Before I begin sharing these tips, I would like to emphasize that these are exactly that, just tips. These are strategies that worked for me. They may not necessarily work for you. If there is something that we love to do here at Saving For Hope it is that we want people to learn from each other. Click To Tweet Saving For Hope envisions a community that could learn from each other through these free online resources. Our blog has helped our family (and others) make decisions to start building a legacy. We want you to take advantage of that information, and we hope that it is helpful for your family as well. I know Mondays are not attractive, especially for a wedding day. However, doing your wedding on a Monday instead of the typical Saturday makes a huge difference. Probably a 50% less cost difference. Because weddings are typically done on Saturdays the cost to rent a venue is extremely expensive. That’s why my wife and I decided to do it on a Monday. If my wife and I would have chosen Saturday for the day of our wedding, just the venue itself would have cost us $2,000. When we asked for Monday the cost went down to $995. You may wonder, “what if my family and friends don’t come since it’s a Monday?” trust me, if they really love you, they will be there. This is your day that is only happening once. Take advantage and plan it how you want it. Choosing one venue for both the ceremony and reception was a wonderful idea. It made our lives so much easier and inexpensive. The venue took care of everything from decorating, to the reception, and cleaning up. Our families and friends did not have to worry about traveling from one place to another as well as leaving anything behind. My wife and I chose a location big enough to do everything there. It was so beautiful that even our photos were taken there. Many venues will give you a discount if you book both the ceremony and reception at the same time. When looking for venues consider doing everything in the same place. You will not regret it. For more information on our wedding venue visit: dubsdreadcatering.com/highland-manor/. My wife was the expert in this department. She saved us so much money that it allowed us to use it in other essential parts of our wedding. For the flowers she purchased them wholesale. The benefit of this is that it is less costly because it takes out the middleman. If you hire a florist you are looking at not only paying for flowers, but also the labor. On the other hand, if you purchase them wholesale you are looking at a minimal cost with no labor. This takes the cost down from a few thousand dollars to a few hundred. In our case we only end up paying $500 which included: one bridal bouquet, four bridesmaid’s bouquet, four crosaches, eight boutineers, petals for the flower girl, flowers for 11 tables, and flowers for decoration around the venue. My wife purchased a variety of vintage glass bottles and candles, and we utilized items we already owned such as candlesticks and picture frames for our centerpieces. This helped to save money because we used items, we already own. For more information on our florist visit: carlstedts.com/locations. My wife and I cannot thank our bridal party enough for helping us out on our special day. We utilized our bridal party to the max. Not only did it help us save time and money, but we also had fun while we all worked together in preparation for the wedding. My groomsmen helped me take all the decorations to and from the venue. They also took care of all my expenses for the bachelor party and transportation of any family and friends. My wife’s bridesmaids helped her with the preparation for all the flowers and decorating the entire venue. They also helped her with all the expenses for her bachelorette party. Think about it, the bridal party are the people who you and your significant one are choosing to be there for you. Choose them wisely. You want to surround yourself by people who have your back and that are willing to go the extra… Click To Tweet As you choose your bridal party let them know that you will be needing their help. If they truly care and love you, they will be there for you. Many rehearsal dinners are done super elegant and at a very fancy restaurant. If the entire bridal party gets invited and both families, it is more likely that you will be spending between $1,000 to $4,000. That is a lot of money. In our case, we decided to have my family help out. I was able to call my sisters, cousins, and brother-in-laws to prep and cook the food. They all pitched in and helped me create a great dinner. We ended up doing it at our house and utilized our backyard to grill out and have fun. Both families got to know each other and friends were there to enjoy themselves as well. Our rehearsal dinner came down to $500 and we fed about 50 people. The open bar was one of the places where we saved the most. At first, we were going to have a full open bar. We said that it was our wedding night and we wanted to celebrate all out. However, as we kept planning, we came to the adult conclusion that the best way to celebrate our love for each together was saving money instead of spending a big chunk on a full open bar. If we would have chosen a full open bar, we would have spent about $3,500 that night. Instead of doing that, we decided to have a consumption bar. We basically limited the bar by putting a $2,000 cap on it. Anything after that we were going to turn into a cash bar. Another reason as to why we chose a consumption bar instead of a full open bar was because our venue gave us the option to add more to the bar at the night of the wedding if we needed. Our venue also let us know that any money that was not used from the consumption bar will be returned to us. Two weeks after our wedding my wife and I received check of $764 in the mail. It was from our vendor letting us know that we did not use the entire money from our consumption bar. Lesson of the day, sometimes celebrating has a lot to do with saving and not spending. I have never done an all-inclusive and I must say, it is amazing. We had the privilege to go to Punta Cana, Dominican Republic and it was great. An all-inclusive allows you to eat anything you want, drink anything you want, whenever you want. It is paradise. Throughout the whole day, we had butlers offering us all kinds of drinks, food, and serving us whatever we wanted. My wife has a friend that helped us book this all-inclusive. Before paying for the package we made sure to tell my wife’s friend our budget, where we wanted to go and to include our flights as part of the package. Many of the agencies have honeymoon specials and throw extra activities to do while at the honeymoon. For more information on our travel agency you can contact katieptraveler@gmail.com. ← How to invest with less than $100 for free!! !